directions for Clearing Mask : wash face with your cleanser, pat dry, then apply very generously, about 7-10 pumps. leave on 5-7 minutes. use tissue to remove as much as possible, then rinse well. Follow these easy instructions to give yourself a facial at home. directions for spot treating with Clearing Pen : very gently tap each blemish with the corner of an ice cube for 30 seconds. after gently drying off, follow with a dab from your P4 Clearing Pen. alternatively, you may dab blemishes with this pen any time of the day. however, if you tend to get "dark marks", use this for spot treatment only at night. perfect for purse or gym bag! for breakouts with irritation, redness and congestion, or for sensitive skin when scrubs or brushes are harmful, this amazing gel eliminates rough, flaky and congested skin, cools the skin to calm and diffuse visible redness, and heals the pore environment that leads to breakouts. gently lifts unwanted pigmentation, dead surface cells and oxidized oil (aka blackheads) from within pores. contains exfoliating Salicylic Acid along with Pomegranate and Pumpkin enzymes, in a naturally exfoliating base of non-clogging Algin and organic Locust Bean gum. Nylon-12, an oil-absorbent micrograin originally developed to absorb oceanic oil spills, quickly degreases skin surface as it enhances the exfoliating action. 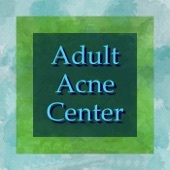 targets red, peeling, and visibly irritated areas common in acne-prone skin. 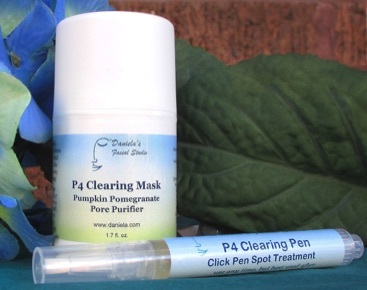 also makes a perfect pore clearing and purifying spot treatment for inflamed breakouts.